The Level II quote window provides the data for pending orders in the market. It displays the size of the best bid and offers with their respective depths. 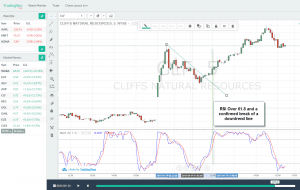 Day traders use level II to gauge the direction of the stock market over the short-term. This article will discuss the working parts of the level II screen based on the tools provided from the tradestation brokerage firm. While level II windows will look differently depending on the broker, the functionality is virtually the same and it provides more information about the trading activity than Level 1. The level II window structure is comprised of four key components: (1) security information, (2) bid ask window, (3) depth chart, and (4) bid ask orders. The first element of the level II window is the general market information for the security. This information will include the symbol name, direction of the bid tick, last price, and net change. As the bid for the security changes, the arrow will shift up and down and from red to green. The last price is the last recorded price for the security. Finally, the net change represents the total dollar amount change for the security from the previous day's close. The bid ask data contains the current bid ask prices for the security. This data has four columns: (1) price, (2) depth, (3) size, and (4) spread). The price in the bid ask window displays the current bid by the asking price. The depth represents the number of orders at the given price. So, if you have 3 * 1 then there are 3 buy offers for every 1 sell. The size shows you the actual size for the bid and ask orders. So, if you have 1000 * 100, that means there are traders attempting to buy a 1000 shares at the given price, while there is only 100 shares at the sale price. The spread represents the difference between the bid and ask. The tighter the spread, the better. 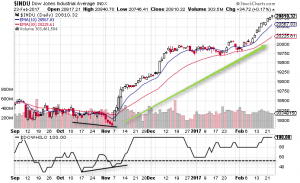 Day traders should look to trade stocks with high volume and close spreads. The depth chart is the visual representation of the orders and their respective size. The color of the graph in the depth chart, will match the color of the bid ask data. If you are day trading attempting to go long, you will want to see the size and speed of the bars on the left side of the depth chart to be larger than the bars on the right. This implies that there are more buyers in the market. 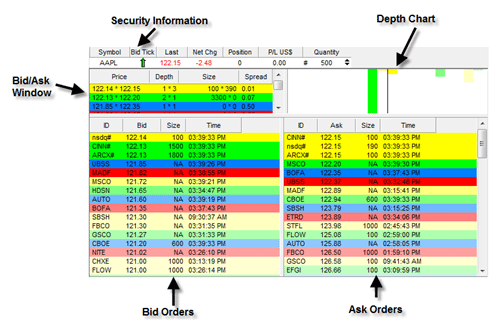 The bid ask orders displays all of the pending buy and sell orders in the market. There are four components of the window: (1) ID, (2) order type, (3) size and (4) time. The ID represents the ECN that the order is routed through. The order type will be either the bid or ask depending on which window you are watching. The size is the size of the order. The time represents the time that the order was placed. The bid ask window is the consolidated version of all the bid ask orders. Traders will look at all the bid ask orders in the level II window, to gauge the momentum and to see how many orders are at a particular level.